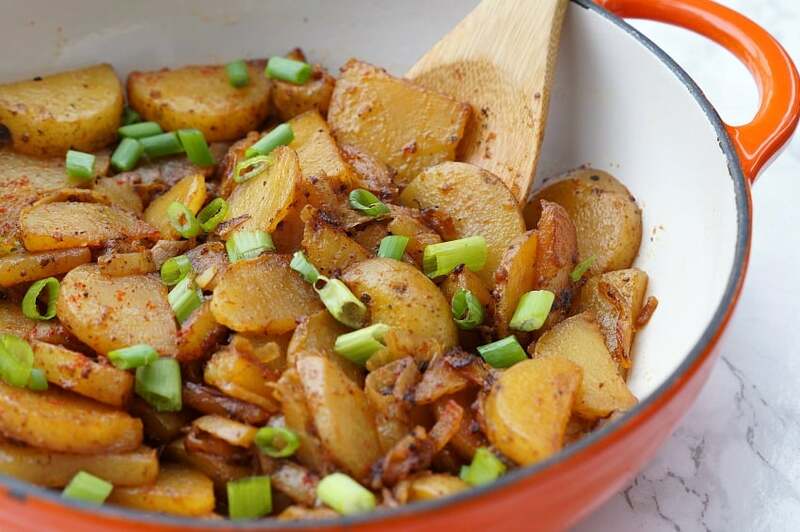 These Perfect Skillet Potatoes make the best side dish! 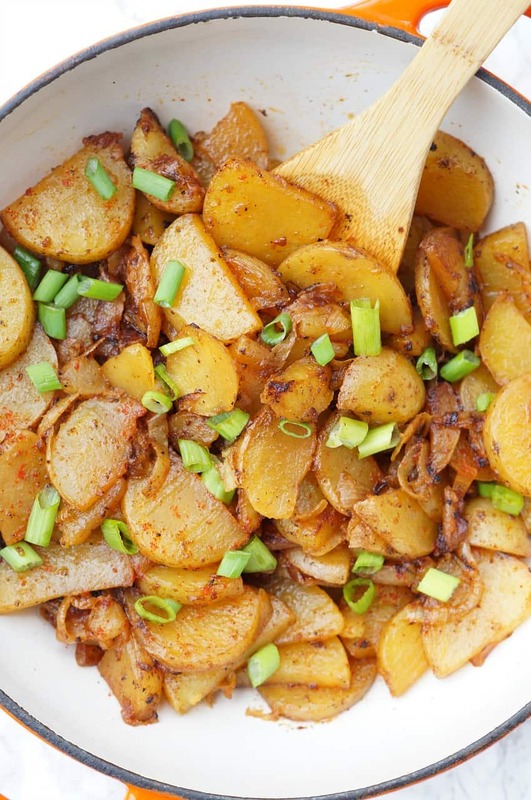 There are two secret ingredients that make these more than your ordinary fried potato! Hi everyone! 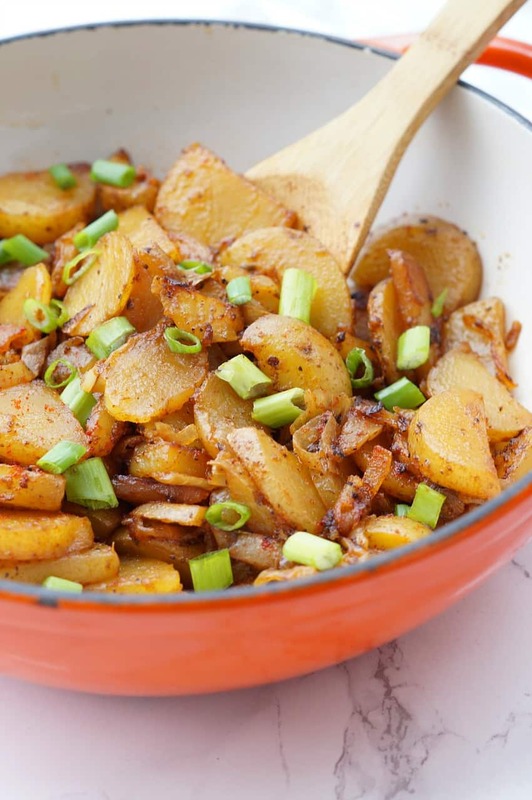 Amanda here from Old House to New Home sharing one of my favorite side dishes, perfect skillet potatoes! 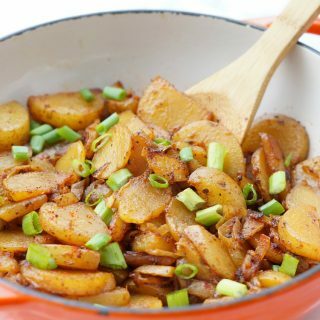 I called these the best skillet potatoes because they just may steal the show from the main dish of your dinner! These skillet potatoes remind me of growing up. 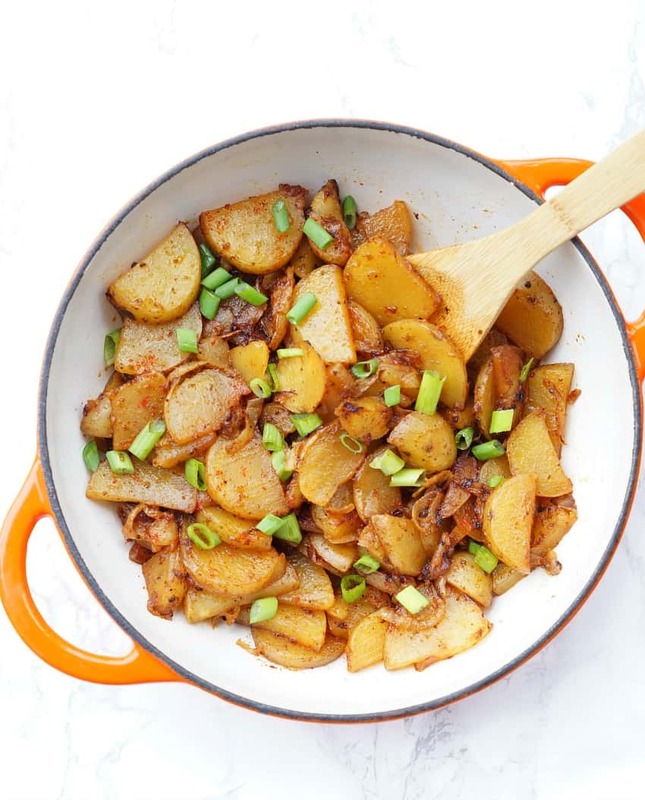 My grandmother always made what she called lyonnaise potatoes to go with so many different meals. Her version used tons of butter and oil and were just so delicious. My recipe uses quite a bit less butter but I have two super star ingredients here that take these potatoes from good to great! The first secret ingredient is paprika. Not only does paprika give them a beautiful color, but it gives it a slight hint of flavor that will have people wondering what that delicious taste is! The secret, and most important secret ingredient here is chicken broth. When the potatoes are almost done, I add chicken broth to the pan and put the lid on. The potatoes steam in that liquid and slowly absorb all of the flavor. It gives the potatoes a rich taste and wonderful texture. The recipe I am sharing here is a great base for you to add even more deliciousness to your potatoes! I like to garnish with a little green onion but some crispy bacon would be delicious too! Even better, throw on some cheese and let melt! 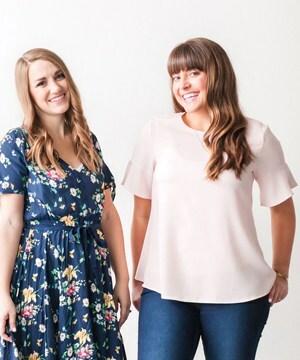 You can really dress these up to go with dinner, but they are also versatile enough to serve as a breakfast potato! Like most potato dishes, this isn’t a quick cook. If you are short on time, throw them in the microwave after slicing for 5-10 minutes, to speed up the cooking process before throwing them in the pan. You’ll sacrifice a little on the texture, but sometimes you need a little shortcut to help dinner come together quickly! Let cook, undisturbed, for 10 minutes. Stir potatoes and then add onion, salt, pepper, and paprika. Cover pan and let cook for 10-15 minutes, or until potatoes are fork tender. Add the chicken broth, stir, and then recover. Cook until chicken broth is absorbed and potatoes are very tender. Add more salt and pepper to taste. P.S. If you love potatoes as much as we do you should try our easy and delicious funeral potatoes recipe next time! Hi, can you tell me at what temp the stove should be. Medium heat, medium high? I don’t want to burn the potatoes. Yes, medium heat! So sorry about that! This recipe does not tell me what temperature to cook the potatoes on. I accidentally burned mine because of this. Oh no, I’m so sorry! We will fix that! So this will be more than a single layer of potatoes,obviously? Do they cook somewhat evenly?